Lakefield National Park is huge. 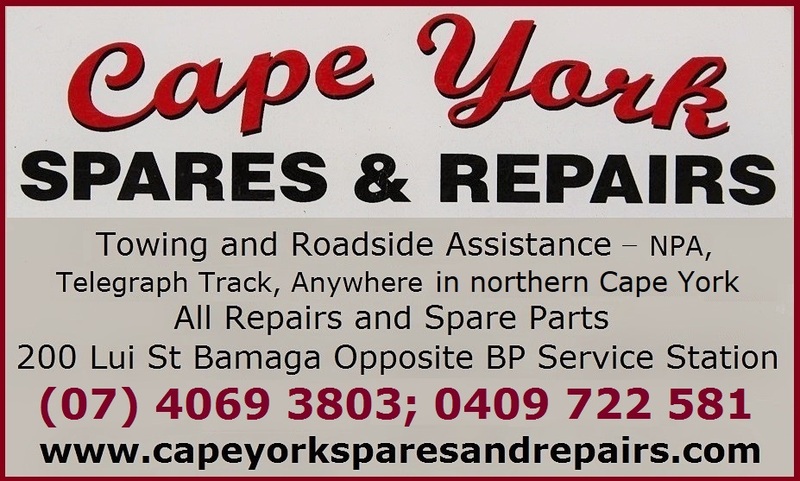 It is the largest national park on the peninsula, and the second largest (after Simpson Desert) in Queensland. 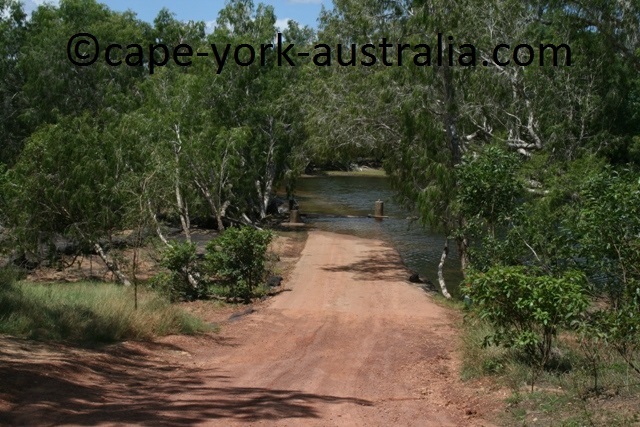 You manage to see it briefly during your Cape York trip if you choose to drive through it, but to do it in detail this park is large enough to be a destination on its own. And that is how it's most often done - by people who come to fish and camp, and stay for weeks each time. But apart from fishing, there are also some walks, there is wildlife to spot, and there is even some great history. 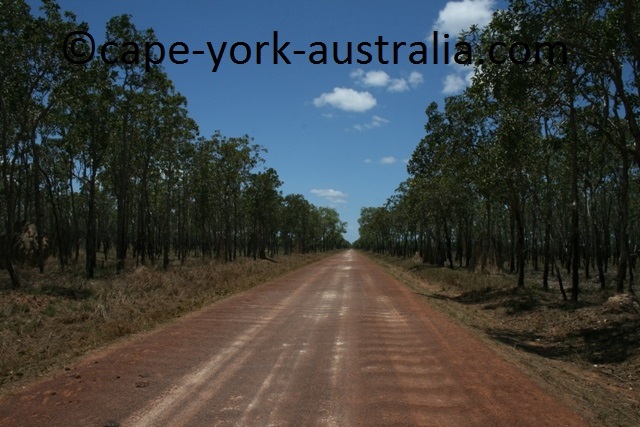 Unlike many other places in the eastern Cape York, the vegetation in this national park is not rainforest. 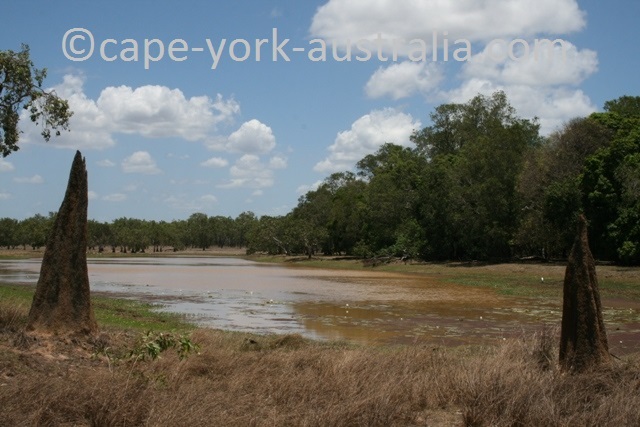 Like Oyala Thumotang it's eucalypt woodland, but there is one big difference - Lakefield gets a lot more flooded during the Wet Season, because there are a lot more large rivers. 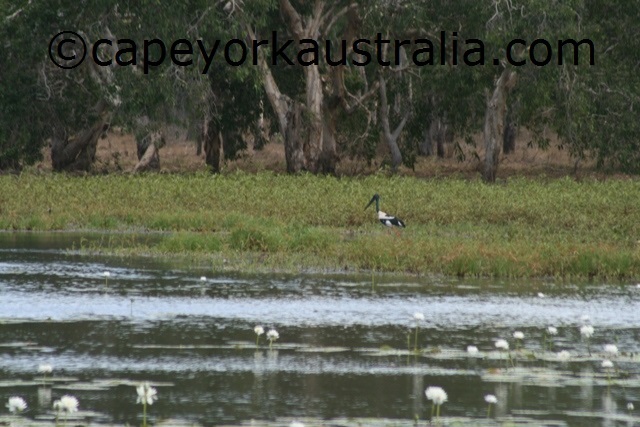 During the Dry Season the water levels drop back, the marine floodplains become grasslands, but all the permanent waterholes and lily lagoons remain, attracting birds and other wildlife. 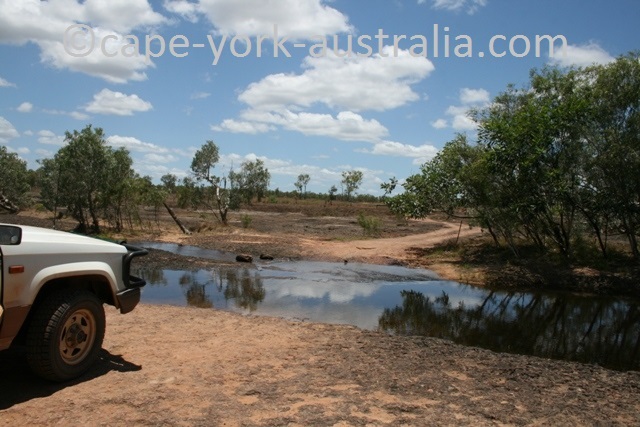 In the southernmost section of the national park, there are camping grounds on Laura, Kennedy and Normanby Rivers - at Horseshoe Lagoon, Welcome Waterhole, Old Laura Homestead, Six Mile Waterhole and Twelve Mile Waterhole. 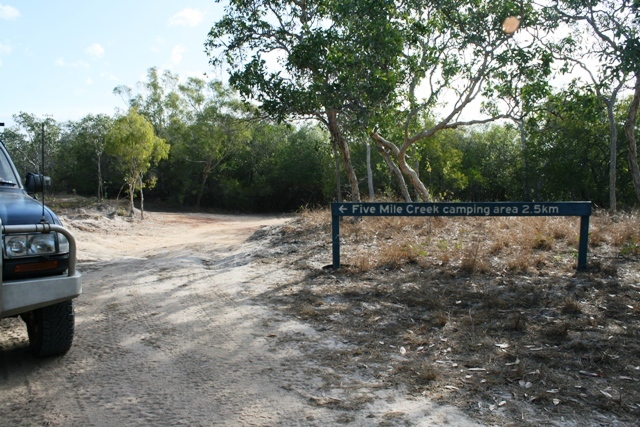 There is no camping at Lake Emma, but you may spot wildlife like a sand goanna. 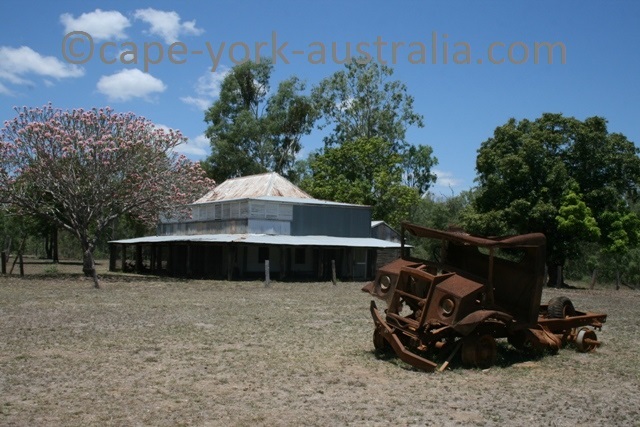 The best historical attraction in this part, and in fact in the whole Lakefield National Park is the Old Laura Homestead. A little further north is another lot of camp spots at Kennedy Bend, Old Faithful Waterhole, Dingo Waterhole and Mick Fienn Waterhole. There is no camping at Catfish Waterhole, but it may be worth driving in and having a look. 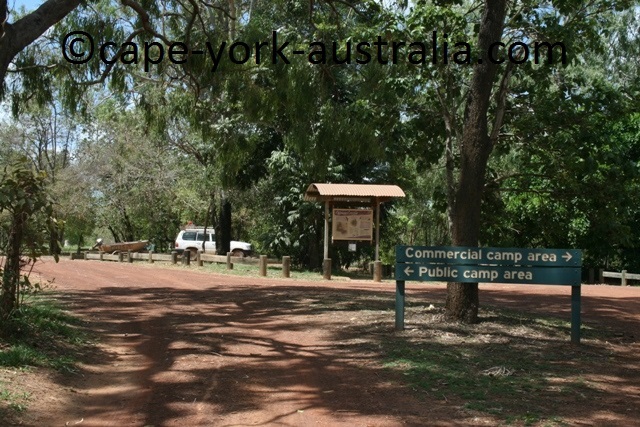 In the central section of Lakefield National Park are two areas of camping spots: those along the Normanby, and those along the North Kennedy River. 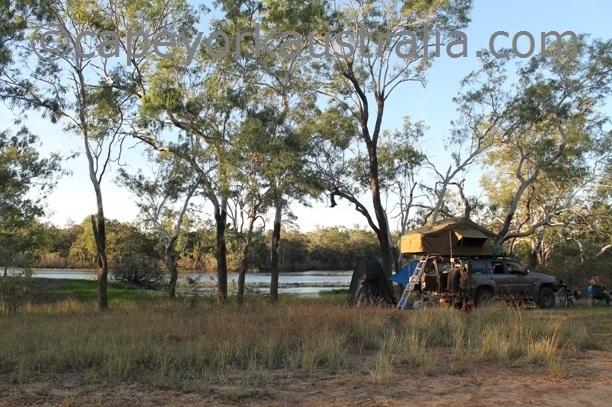 The Normanby spots are Kalpowar Crossing (the central and most popular camping gound in the park, with most facilities), Midway Waterhole, Hanush's Waterhole, Melaleuca Waterhole, Orange Plain Waterhole, Top Whiphandle Waterhole and Bottom Whiphandle Waterhole. 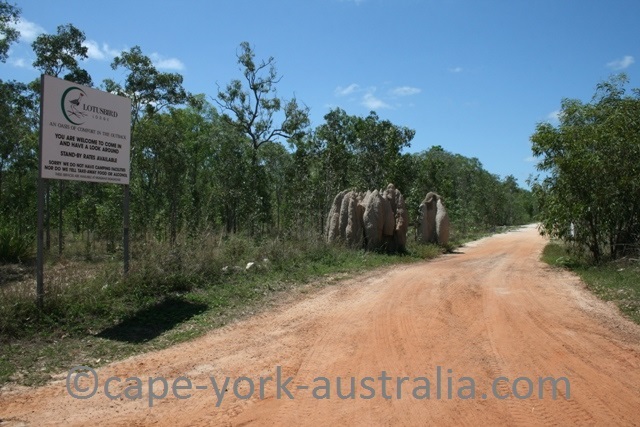 The central North Kennedy spot is Hann Crossing - the second most popular camping ground, with toilet facilities. 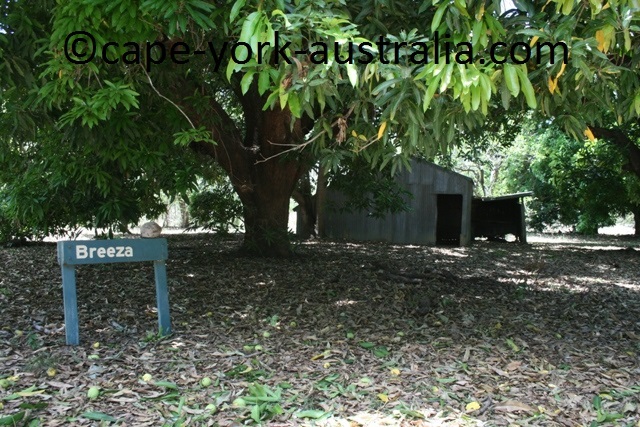 Along the main Lakefield road which goes between the two rivers, there are the White Lily Lagoon, Red Lily Lagoon, and the Old Breeza Homestead - another historical landmark, the second best in the park. North from the Hann Crossing are the Basin Hole, Bizant River and Brown Creek camping grounds. 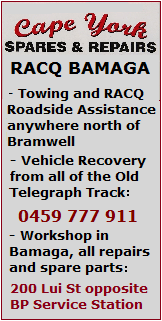 And in the north west are Nifold Plain, Rarda-Ndolphin Low Lake and Marina Plains, with camping at Saltwater Crossing, Sweetwater Lake, Five Mile Creek and Annie River. Lakefield National Park does not have many bushwalks, but there is one stroll you can do from Kalpower Crossing camping ground. It is a four kilometres easy walk that goes to Normanby River and back through vine forest and open woodland. 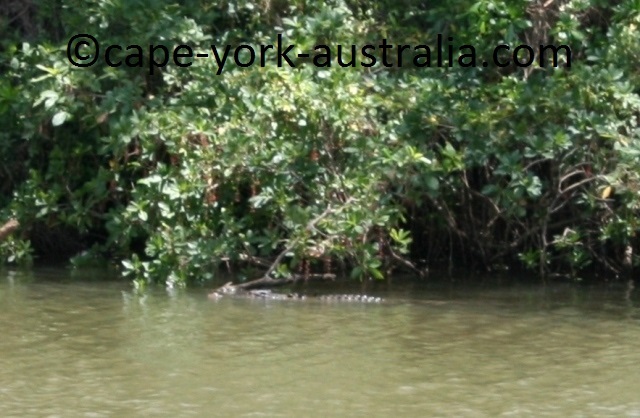 And you don't need to walk to see the park's most famous wildlife - the crocodiles. The photo above is taken from a drive in the middle of the day. In the Musgrave end of the park is Lotusbird Lodge. This is the closest accommodation to the park, all the rest is camping.